In today’s world of digital marketing, it is important to stand out from the crowd and really be able to provide your audience value. Today, we will be discussing the importance of utilizing content upgrades for your business. These are FREE downloads and added benefits to your blogs that your audience wants. This shows your audience that you are an expert in your industry, by providing valuable content on a topic your audience is already looking for. You are able to connect with them and start building trust with them. It’s about the – Know, Like, Trust factor. By utilizing Content Upgrades it allows you to grow your email list. Having a strong email list to market to is like gold. This happens because in order for your audience to receive their free content upgrade they need to enter in their name and email. Another key factor to using Content Upgrades is you are able to understand your audience more and really know what they are looking for so you can write more content for them. Once you have their email address you can remarket to them with future items similar to your content upgrade, this is called the nurturing process, building the trust with them so they will want to do business with you. So, let’s take this one step at a time and go through the process of what a content upgrade can be and then how to create one. Content upgrades are the free downloads that you sign up for in exchange for your name and email address. The content upgrades can be a variety of things. One key place you can look to start thinking of what your content upgrade should be is your FAQ section on your website. This FAQ section gets a TON of SEO benefits from Google, so looking at what your top questions are or event turning those FAQ into a content upgrade. Here are a few examples of content upgrades. The goal of these upgrades is to increase the number of subscribers on your email list. All of these items can be used to grab the attention of your target audience. 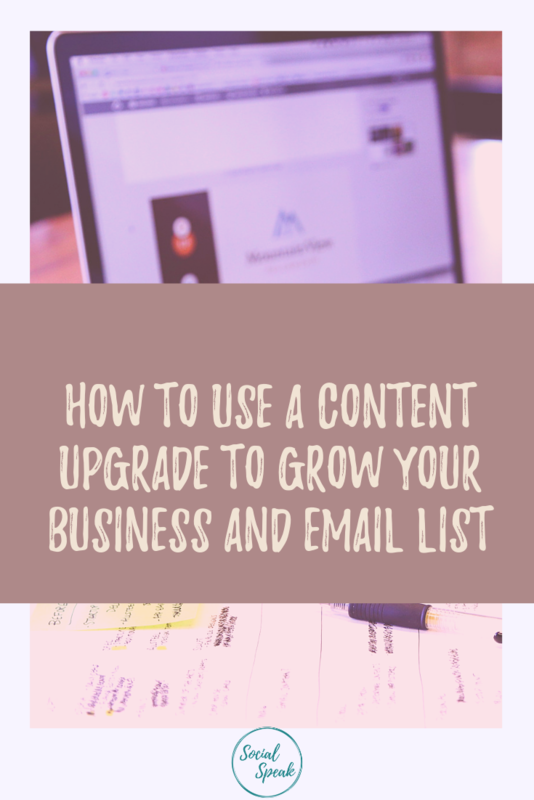 You are creating a valuable piece of content that your audience wants, they then give you their name and email to download this content upgrade. 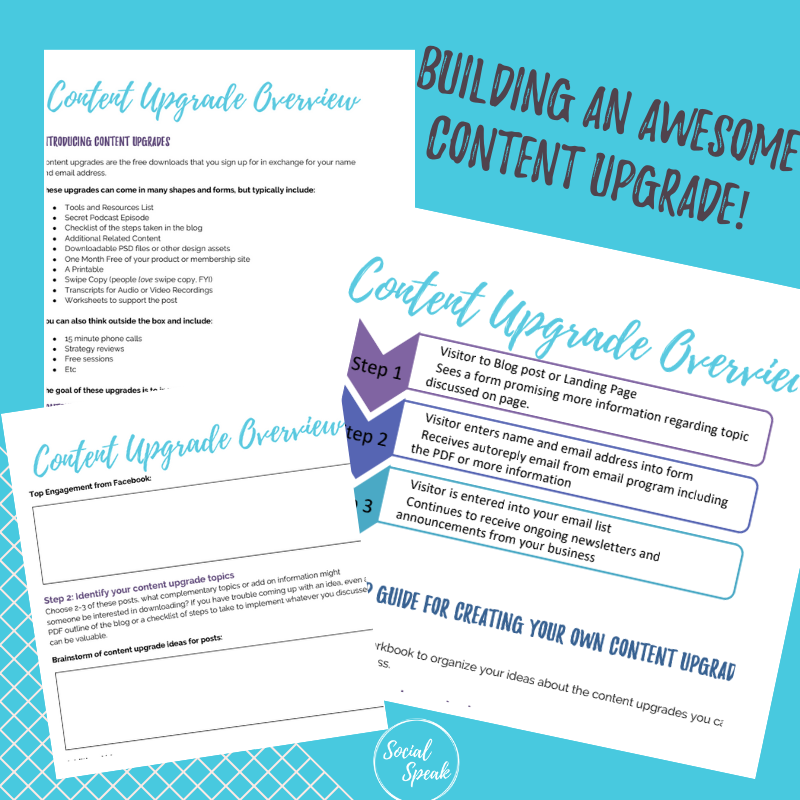 Now, that you have an idea of WHAT a content upgrade is, it’s time to start planning what you should be creating for yours. It’s very important to be clear about what you are going to create, and understand that you will have multiple content upgrades. You may do a content upgrade for each blog post, or each service you offer. For example, if you are a nutritionist and work with clients one on one, you may write a blog and your content upgrade would be a grocery checklist or a food substitute checklist that your audience can download for free then they learn to trust you. Then if you have another blog or maybe even promoting your coaching services you may have a 3-part video series as your content upgrade to help your audience know, like, and trust you along with giving them valuable information within the video series. Now, that you have figured out your topic and then format you want to create your content upgrade on, it’s time for the fun part! PDF: These are great for workbooks, checklists, Guides, etc. Simple tools like Word, Pages, Google Drive Slides, or PowerPoint are all easy to save as PDF’s. Email Course: These don’t even require PDF’s. In an email course, you are sending valuable information over the course of a few days. This makes it so the recipient isn’t overwhelmed by information and sees your name pop up more frequently. MailChimp allows for automated email sequences, which is a great free way to share this content. Free consultation: All you need here is your phone. 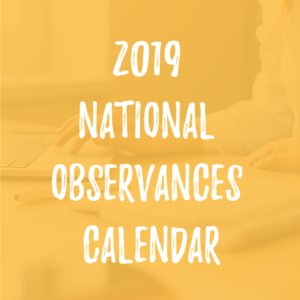 You can use Calendly.com to set time blocks that you are available for consultations to reduce the back and forth. As subscribers are added to your email list, it is important that you are tagging these individuals with what they were interested in. For us, for example, someone who is interested in information on how to manage their Facebook, won’t be interested in information designed in educating other social media managers. We want to make sure any future emails we send to our list align with the topics they initially were interested in. Let’s dive a little deeper and talk about how to create each of these things. I love using Google docs because it is a live document and you can use it from any device, it is also great if you have a team that will be working on this project together. Don’t worry about fonts, colors, visual appeal at this point. It is just about getting the words on the paper at this point. You can add images and change font later once you have the content complete. Sometimes, I worry too much about the visual appeal at the beginning that I lose focus on the value of the content. If you choose to use Canva just to create your Cover image then you would download that image to your computer, then head over to your Google Docs and insert that image on the first page. Check to make sure you have the images in the correct areas, the fonts you want and the right brand colors. If you do not have the correct brand color number you can use this FREE Chrome extension ColorPick Eye Dropper, this works to pull the correct color number that then you can add to Google Docs and Canva. Save it to your computer. This saves it in an 8.5×11 PDF. You want that PDF to have a URL so you can add it to your sign-up form within MailChimp or Lead Pages. You can upload this PDF to your WordPress website into the media area, this gives you the URL so you can hyperlink the download within your welcome messages in your sign-up form. We love to use MailChimp because it is free and very simple to use. Now, you have everything created and ready to start having people sign up, right? It’s time to create your landing page and your form so people can start signing up to get your free content upgrade. Like we said in step 4, we use MailChimp because it is simple and easy to use. There are other options like using your website or LeadPages as well. In the video below it walks you through the MailChimp process. I hope from this blog you are able to see the big picture behind these content upgrades/free downloads. There are so many different ways you can tie these into your marketing. One thing I love about content upgrades is it gives that extra oomph to your blogs. I love the creative process of creating a content upgrade. Have fun with this process and maybe create 2-3 to start and see which one performs better! Social media networks and search engines can change their algorithms without warning. Email marketing is currently (and historically) the most effective way to continue building trust with prospects, increase recurring revenue, and see an ROI from other marketing efforts. The Social Speak Email Marketing team works with your strategist to build content upgrades, welcome series, and newsletters to stay top of mind.